We know that when you shop, whether its online or in-store, you want to receive quality merchandise at the lowest possible price. At TheBathOutlet, we intend to provide the best customer experience by offering products at reasonable prices. Most of our products are already set at a reduced 30% off from retail price, and we have a variety of merchandise in our clearance section with higher discounts applied. Why stop there? TheBathOutlet wants you to save as much as possible! Whether its free shipping on orders over $99.00, or no restocking fees for returns, we are always thinking of ways to help you save. From time to time, TheBathOutlet will run a store-wide sale or daily deals for specific products. Please check our daily deals page to see products that are on sale. TheBathOutlet may also present surprise holiday or daily sales, in which a special discount and coupon code may be available. A surprise discount coupon code is only applicable on orders placed on the specified sale day. Unfortunately, if your order has not been placed on the specified sale day, or has already shipped, we cannot make any price adjustments on past orders. 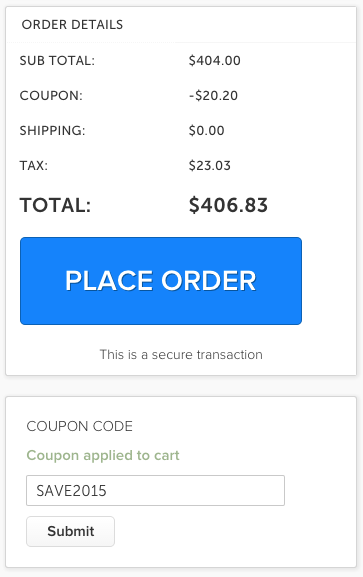 Coupons will be applied on the final page before placing an order (right underneath the "Place Order" button). Coupons can only be applied to orders placed directly on TheBathOutlet.com. Coupons cannot be applied to items already in an event sale (these items will have a red sale sash over the product photo). Coupons cannot be bundled or combined; the largest discount coupon will apply. Coupons cannot be combined with a Professionals discount. Also, are you a new customer? Sign up at the bottom of any page for email updates, newsletters, and future promotional offers to receive a coupon for $10 off your first order over $200! Within minutes of signing up, you will receive an email with your coupon code and information on how to use it. Keep in mind, this coupon can only be used once and will expire after your first applicable order. This coupon will be applied on the final page of the order process through our website (after you create an account but before you place the order).